On today’s episode of THE FOOD SEEN, we step on the gas of a 1952 Probat. This German cast iron machine can fire through 22 kilos in a day, but when did how we take our coffee become the Third Wave of caffeinated culture as we know it? 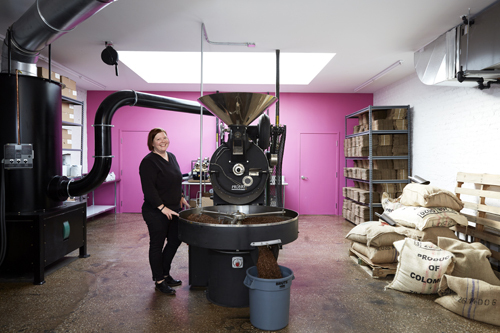 Darleen Scherer started roasting beans in-house at Gorilla Coffee (Park Slope, Brooklyn) in 2002. Over a decade later, she brings us Supercrown Coffee Roasters, which doubles as a café where you can get your pour over, and a weekly subscription service which sends out boxes of peak harvest picked, roasted in season coffee beans from Huila (Colombia), Cajamarca (Peru), and the Korngi District of Rwanda. We’ll talk aroma, taste, mouthfeel, and sit through a cupping with Darleen who happens to be a Sensory Judge for the US Barista Championship. And don’t ask for milk, no, “well roasted coffee doesn’t need milk”, but there’s that Coffee Milkshake (sweet cream, espresso, grinds) just in case you don’t take it black.